Knopf Books for Young Readers, 9780385392099, 96pp. The instant New York Times bestseller that's perfect for President's Day! This special treasury from America's beloved documentarian Ken Burns brings the presidents to life for our nation's children. Each president is given a lushly illustrated spread with curated stories and information to give readers of all ages a comprehensive view of the varied and fascinating characters who have led our nation (with the exception of Grover Cleveland--the only president to serve two non-consecutive terms--who gets two spreads!). A must-have for Ken's many fans, classrooms, and anyone who wishes to gain a greater understanding and appreciation for our country. Since the Academy Award–nominated Brooklyn Bridge aired in 1981, Ken Burns has gone on to direct and produce some of the most acclaimed historical documentaries ever made. These include The Roosevelts: An Intimate History, The Civil War, The National Parks: America’s Best Idea, and Baseball, among many others. 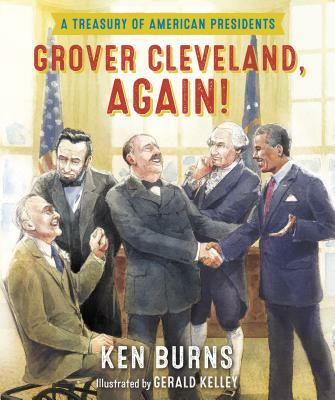 A father of four, Ken was inspired to write this book by his daughters, who, when they were young, enjoyed reciting the names of the presidents and would gleefully shout out “Grover Cleveland, again!” when they got to his second, nonconsecutive term. Ken lives with his family in New Hampshire. Find out more about Ken and his films at kenburns.com or @KenBurns. Gerald Kelley has illustrated several books for children, including My Name Is Bob by James Bowen and Garry Jenkins (a picture book prequel to the New York Times bestseller A Street Cat Named Bob) and M Is for Monster: A Fantastic Creatures Alphabet, by former U.S. Children’s Poet Laureate J. Patrick Lewis. Gerald lives in Colorado. You can see more of his work at geraldkelley.com.